These fabulous homemade Won Tons are a great Eskelson Family Tradition. My father in law Mark, spent 2 years as an LDS missionary in Japan, and MyHandsomeHusband served a mission in Korea. They both learned to love them while they were serving, and have since put in many hours making them for family. They certainly take some time, but the finished product is well worth the work involved. My kids are great at filling the won ton shells, we usually make them on a Sunday afternoon when everyone is available to help. We also make them at least once a summer while at Bear Lake with our Eskelson family…many hands make light work. The dipping sauce is another of MyHandsomeHusband’s fabulous creations. This recipe makes about 100 won tons, so depending on how many you are serving (and obviously, how hearty of an appetite they have!) you could half this recipe if you chose to. The dipping sauce will keep in the refrigerator for a good long time, up to 2 months. My kids like to pour it on top of plain rice. Hope you try it…..I know you’ll love it! 1. Chop the veggies up super small. We actually put them in a mini food processor, a few at a time to get them the right size. You want to be careful not to turn them to mush. 2. Mix the veggies, seasonings, and hamburger together. Add the egg and mix well. Adam usually just puts his hands in the bowl and mixes it all up that way. 3. Mix the flour and water together to make a paste. 4. Lay four won ton wrappers out at a time in a square. Dip your finger in the paste and then coat the inside edges of the wrappers with it. You can see in the picture below which edges have the paste on them. 5. Place about 1 T of meat mixture into the center of each wrapper. 6. Fold the edges of each wrapper together, and press so the paste has a chance to seal. Repeat with all wrappers. 8. After all the won tons are cooked (we usually have 2 fry pans and an electric skillet all going at the same time to speed things up) pour the Dipping Sauce ingredients into the hot fry pan. Stir to dissolve the sugar. Let it heat through for about 2 minutes. Pour into a serving dish and you are ready to eat. We serve it with piping hot white rice. Uh, Yum!!!! I'm totally going to try these out soon. I LOVE WON TONS! Happy Sat SITS! These look delicious…and your daughters are adorable!! I have been looking for a while now for a Soft and Chewy Chocolate chip cookie recipe. I was wondering if you know a good one? Funny you should ask about chocolate chip cookies. I have a recipe I am planning to post this week sometime. It's fabulous! Been making them for years..hope you enjoy the recipes! These are so so so so good! My husband and I just finished making and eating them and it's probably now our favorite dinner (your sweet pork is tied with it)! I'll be sharing your blog with lots of friends! The hamburger is raw when you put it in. They usually cook up just fine. You need to cook them 5-6 minutes on each side. Good luck! Hope they turn out well. This recipe looks really great. I have one question though. I'm pregnant and am a little weird about ground beef right now. Do you think this would taste good with ground turkey or ground chicken?? I bet it would work out just fine to use ground turkey or chicken. Let me know how it goes! We tried them out with ground turkey and it was fantastic!! We had a hard time getting an even brown on the wontons, but its probably operator error (and our uneven electric stove!). Still flavors were wonderful! So glad to hear you loved them! And yes, you can deep fry them. I used ground turkey for this recipe and it was SO GOOD! I didn't care for the dipping sauce though. It was too vinegary (is that a word?) for me. We have started substituting the ground beef for mild sausage. I LOVE the flavor! Totally changes it…in a good way! YAY!! We also put approx 2T of peanut butter in the dipping sauce. (soy butter actually- because our oldest is allergic to PB). WHOA!! FLAVOR!!! I am kind of lazy, so I put a bag of coleslaw in place of the cabbage, carrot and stuff. I do add the onions, though. This is now a Lee family favorite. I get requests from my in-law bro/sisters to “come to my house for won tons”. They feed an army and everyone LOVES them. I’m so glad you loved these, they are a family favorite around here. 🙂 If you have leftover meat filling, you can freeze it and then use it another time. Just be sure to let it thaw completlety. It will be a little bit “wet” but if you press the liquid from it you should be fine. Good luck! This looks wonderful. We lived in Japan for many years, and my kids are totally missing the food. 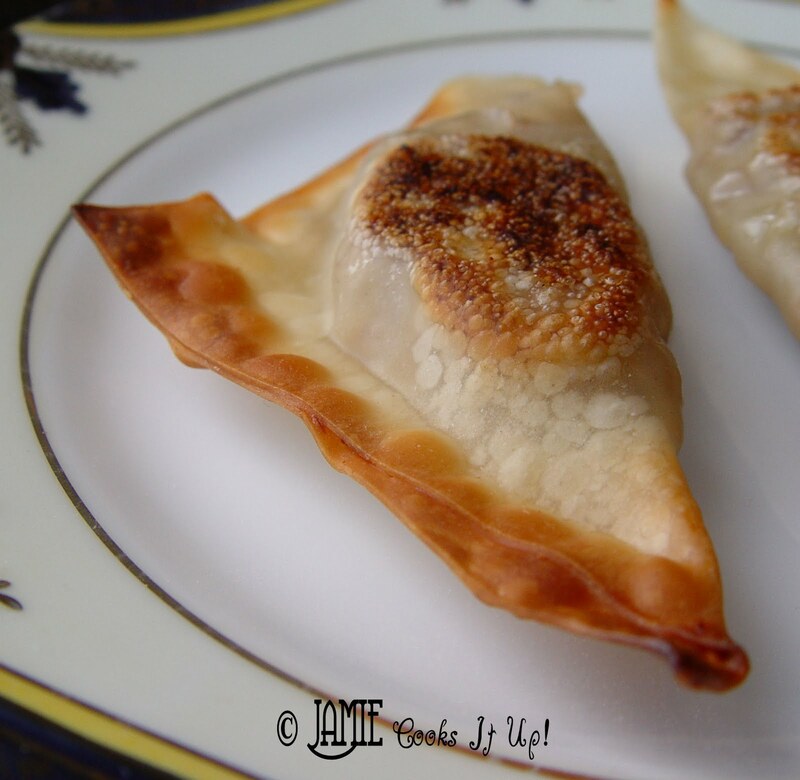 Have you ever frozen the wontons before frying them? There’s only 4 of us here and I think 100 would be a bit much for us to eat. Hey jamie, I love your site! I was wondering if you could go ahead and cook the filling the night before and then put them into the wonton paper? The filling and the outer shell need to cook together to make these great. Best of luck! These look great – my only issue is that I cook for just 1 – 2 people every day and always have leftover produce go bad because I cannot eat it in time. Have you ever made these in advance and froze them? Wondering if they would still be good (and as I am new to this freezer cooking method), am assuming it would have to be frozen uncooked and then cooked when ready to eat? 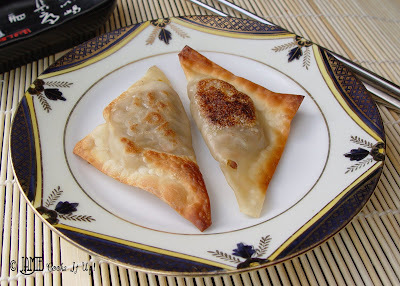 I haven’t ever frozen the actual stuffed wontons, so I’m not sure how it would work out. I imagine if you could lay them out flat on a cookie sheet and freeze, then store them in a ziploc bag they would be fine. I have however frozen the filling with great success. Just let it thaw when you are ready to stuff the won ton wrappers and you will be good to go. Best of luck to you! Made these today & my 10 year old son & the husband loved them! Pan fried technique was easily explained & I nailed it! I was worried I was being wasteful, making such a large batch but I just went to the kitchen and there are hardly any left! I have tried making pork dumplings before but I can’t seem to get the meat flavored right. Using this beef mixture was tasty good. Thanks so much for your recipes–this one is a keeper. These were delicious! I loved the dipping sauce as well….so much flavor! Thanks for this very tasty recipe. Wonderful! Thanks for letting me know.